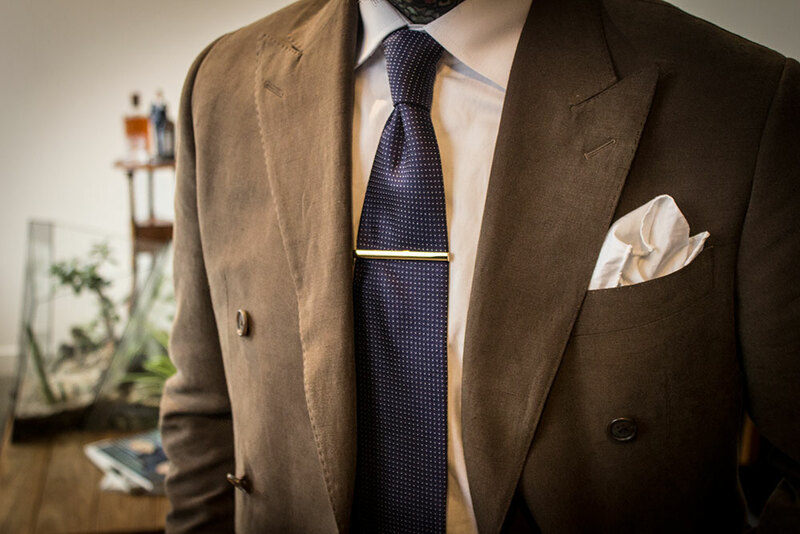 "It’s a small detail to improve one’s appearance; subtle and not in the least ostentatious"
One accessory that exemplifies sartorial flair and heightens masculinity is the humble tie clip. For men who seldom wear jewellery, it’s a small detail to improve one’s appearance; subtle and not in the least ostentatious. Also known as a tie bar, slides or clasps, tie clips fasten horizontally across a gentleman's tie to hold it to his shirt placket. The aim is to secure the tie and to keep the slim end from appearing where it’s unwanted, thus solving the daily consternation we men face. So how did this tiny piece of metal become the staple for well-dressed men worldwide? When tailor, Jesse Langsdorf first cut tie fabric on the bias to improve elasticity and prevent buckling, a revolution started and men wore this new style in droves. A time when pride of appearance took priority, a tie clip was only a natural style progression. A tie clip is the evolution of the earlier tie pin worn with cravats since the late 17th Century, though its design was problematic as it would puncture and damage silk ties. Enter the tie clip, a 1920s invention following the late-1800s advent of the four-in-hand style of necktie. Tie clips rose to prominence over the decade and came in a variety of styles and decorative shapes. A favourite of members’ and sporting clubs, military and exclusive schools they became a fashionable and sought-after accessory. Over time it fell out of favour, but like all good (and bad) trends it has reappeared. In the Sixties, the newer slim mod look and narrower ties were perfect for sleek tie clips, and with recent fashion-focused television such as Mad Men, tie clips have resurfaced as a must-have accessory. A tie clip should always sit between the third and fourth buttons of your dress shirt. Any higher and it’ll look strange, any lower and it’ll become caught on your jacket. While decorative, it should serve its intended function and should always fasten to the placket of the shirt, not just the tie. If you wear a waistcoat or a cardigan you can skip the clip. Not only will it catch, but waistcoats already hold your tie in place and a cardigan is too casual a garment to be paired with a formal accessory. Wear it with a shirt and blazer and choose a clip to suit your tie. The tie clip is more often than not narrower than your tie (but not always) and should sit parallel to the top of your trousers. When you fasten your tie to your shirt lift the tie slightly to give the tie some room for movement. It will give your tie some depth and you won’t feel constricted or like the tie clip is fastened to you. Oscar Hunt has a selection of tie clips for you to choose from in our showroom. A range of colours and styles, there’s one to suit your entire tie collection.